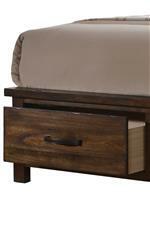 Rustic style and functionality, this queen bed will make the perfect addition for your bedroom. 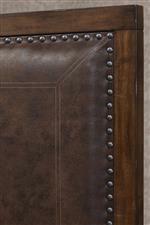 This bed is covered in a rich brown finish that is complemented by the upholstered headboard and large nailhead trim. You'll find two storage drawers on the footboard perfect for storing extra blankets and pillows close by for when you need them. The Cameron Rustic Queen Upholstered Bed with Footboard Storage Drawers by United Furniture Industries at AHFA in the area. Product availability may vary. Contact us for the most current availability on this product. 1043-52 Queen Rails, Slats, and Support 1 0" 0" 0"
1043-53 Queen Footboard Storage Drawers 1 0" 0" 0"
1043-51 Queen Headboard and Footboard 1 0" 0" 0"